Pat asked me to stitch a wedding quilt for her daughter & future son in law. 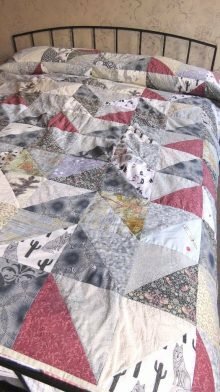 The fabrics in this quilt were chosen for significance to the bride&groom. 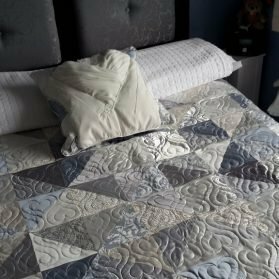 The colour scheme for the quilt tones in with the interiors at to the couple’s home. 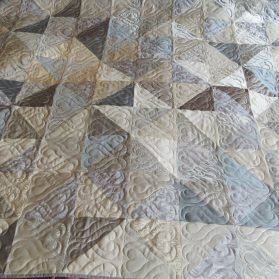 The distinctive triangular patchwork design was chosen as the mother of the bride was given a similar patchwork quilt for her wedding. 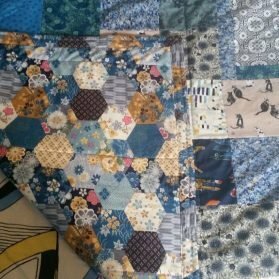 This is a truly unique personalised wedding quilt commission. 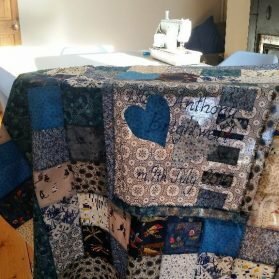 Pat kindly wrote; From my wide and varied theme request and colour challenge, Lisa has patiently sourced, planned, advised and sewn the most wonderfully individual gift, which surpasses all my hopes and expectations! 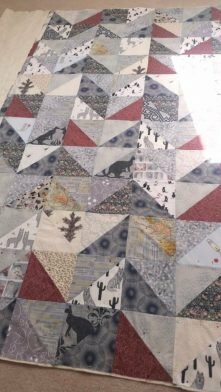 Wedding quilt top being stitched. 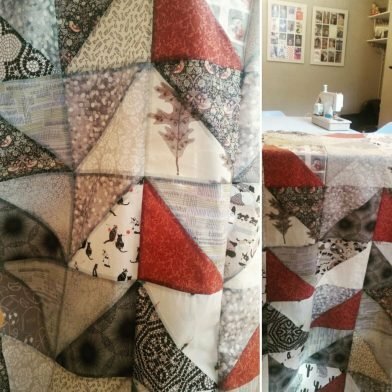 Joining top of quilt to batting and backing fabric. 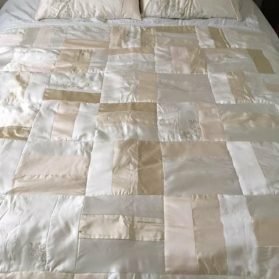 Finished bespoke wedding dress patchwork quilt. 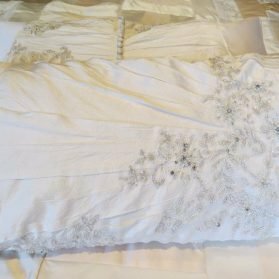 Here is what Helene said; I was determined to find a use for my wedding dress; I couldn’t bear the thought of it living in a cupboard for the rest of my life. Thanks to you it will live on as a reminder of our special day. You truly offer a unique service, and I hope more brides are inspired to do the same. 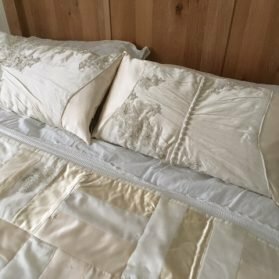 I am delighted with my wedding dress quilt and cushions, thank you so much! The materials you chose really complement the fabric and show off the embroidered beaded flowers. The cushions are beautiful, especially the one showing off the buttons, which was one of my favourite part of the dress. It was a great idea to have them made into cushions. Thank you!! Lia and Anthony were married last month. 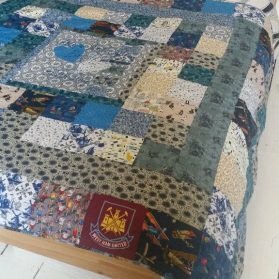 Their chief bridesmaid and the couples best friend Ally wished me to create a truly personalised wedding gift, so armed with a list of references and a colour swatch I stitched them a wedding quilt linking to their histories (lots of Dutch inspired printed images), interests (running & wine glasses) and passions (West Ham United and cats!). 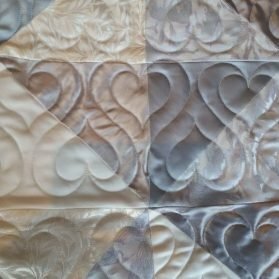 Detail of Heart motif stitched quilting pattern.